When Chávez, with the assistance of military loyalists and massive street protests of his own, returned triumphantly to office less than 48 hours after he was ousted, the Times was forced to issue a half-hearted admission of error. The abortive coup became widely acknowledged as a huge mistake, and its numerous defenders around the globe walked away with egg on their faces. Respectable international opinion will likely take longer to come around after this week’s events in Egypt. President Mohamed Morsi was overthrown by his country’s military on Wednesday — “not a coup,” it is once again claimed — but unlike Chávez, Morsi probably won’t be coming back. The military has always been closer to the levers of power in Egypt than in Venezuela, and Morsi’s public support is not nearly as widespread as his late Venezuelan counterpart’s. But the one thing both events have in common — and let’s not fool ourselves here — is that they are both military coups carried out against democratically elected leaders. None of this is meant to defend Morsi; he has autocratic tendencies and issued a decree last year concentrating excessive power in his own hands. Nor is this meant to dismiss the movement of millions out in the streets protesting against Morsi’s rule; the economic difficulties they face are immense, and they are right to expect accountability from their leaders. But once the immediacy of this week’s events has receded, once the history books are written, Morsi’s ouster will be remembered as a coup d’état not unlike other coups d’état. A tinge of inspiring “people power” perhaps, but more than the recommended dose of old-fashioned authoritarianism. To spurn the 52 per cent of the Egyptian electorate that voted for Morsi in last year’s run-off presidential election is no solution to the heavy polarization the country faces, just like many other democracies, young and old. Before being overthrown, Morsi suggested the formation of a consensus coalition government in the lead-up to parliamentary elections. Was his offer sincere? Maybe, maybe not. But as his country’s elected leader, Morsi at least had a more legitimate claim to spearhead efforts at national reconciliation than the generals who have given Egyptians nothing but tyranny for decades. Even if the military does facilitate new elections as promised, it almost certainly won’t allow Morsi, now in detention, to run, and the crackdown currently underway against his Muslim Brotherhood is sure to have a chilling effect. This is not a step forward for Egyptian democracy. 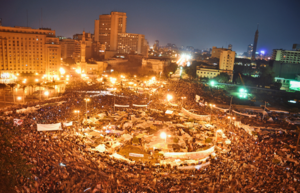 Despite Morsi’s many faults, despite the unprecedented size of the protests, despite the celebrations and fireworks among the crowds in Cairo’s Tahrir Square, this week’s coup d’état in Egypt is an unequivocal step back. This post appears in rabble.ca. This entry was posted in Democracy, Middle East and tagged Arab Spring, coup d'etat, Egypt, Mohamed Morsi, Muslim Brotherhood by David Taub Bancroft. Bookmark the permalink. Morsi may have received 52% of the votes cast. However, that does NOT mean, as you claim, that 52% of Egyptians voted for him. It may seem like a side issue but I am tired of this sloppy electoral talk. Since there was less than 50% turnout, (and it is a country with significant problem with voter registration and several million were not registered) we can safely say that less than 25% of adult Egyptians voted for Morsi. Four times as many people signed the petition calling for Morsi to step down than actually voted for him. If we are going to be “technical” about this “coup,” lets at least get the facts straight. That’s a fair point. I’ve changed “Egyptians” to “the Egyptian electorate.” Thanks.